In October 1997, representatives of the National Aeronautics and Space Administration (NASA) and the Department of Health and Human Services (HHS) signed a unique partnership agreement to fight breast cancer and other women's illnesses in the areas of reproductive health, pregnancy, and osteoporosis. Supported by academic and private partners, the alliance has produced quick results starting with breast tumor enhancement software that provides doctors with clear, accurate three-dimensional (3-D) images made from a series of scans of the breast and tumor. 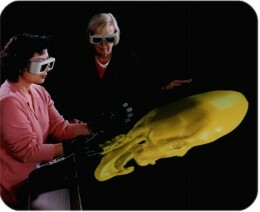 Each high fidelity 3-D picture is known as a "reconstruction," a computerized object that a physician wearing 3-D glasses can see from all angles on a computer monitor. Normally, mammograms are used for initial breast cancer screening. If the radiologist detects a suspicious lump, the patient undergoes a follow-up Magnetic Resonance Imaging (MRI) scan during which a contrasting medium ("dye") is injected into the patient's bloodstream. The medium rapidly concentrates in the tumor which shows on the MRI scan as a bright area. But, even with this technique, it's hard to see where the tumor begins and ends.